The left half of the photograph shows a boy who was one year old at the time of exposure, resulting in a severe form of hypothyroid/cretinism. 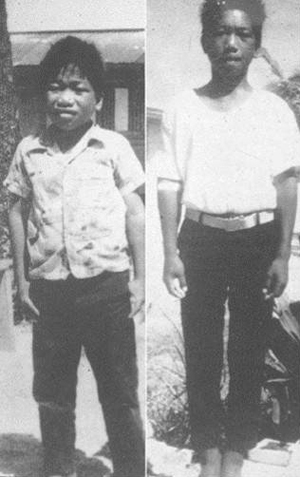 The right half of the photograph shows the same child three years later following treatment with thyroid hormone. Radioactive iodine in the fallout is internally absorbed by inhalation and injures the thyroid. The developing thyroid of infants and young children is very vulnerable. Nearly all of the children under ten years of age developed injuries to the thyroid.